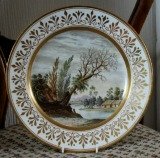 A fine Coalport Porcelain Cabinet Plate (Outside Decorated) c. 1810, the centre finely painted with a landscape, gilded rim. Dimensions: 23.5 cm diam. Excellent condition. Unmarked. A pair of rare Coalport porcelain dessert plates c.1805-10*, spirally moulded with basket-weave border, each painted to the centre with a figure in traditional Swiss costume , within a foliate gilt cartouche and celadon border. Dimensions: 22.2 cm diam. 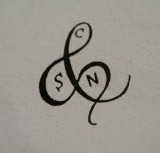 Marks: titled to the reverse and decorator's mark for "Powell, 91 Wimpole St". Condition: Minor ware and crazing. Coalport Porcelain Milk Jug c.1813, painted with a landscape in sepia monochrome and gilt, painted initials "S" and "M". Dimensions: 11.5 cm high x 12.5 cm. Unmarked, paper label: Godden Reference Collection. Excellent condition. 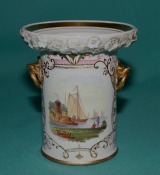 А rare Coalport/Nantgarw Porcelain Vase c.1820 with gilded ring handles held by moulded birds, incrusted with flowers under the rim, finely painted in Meissen style with harbor scenes, unglazed base. Dimensions: 10 cm high. Condition: restored chip on the base rim, minor chipping on the encrusted flowers. Unmarked. 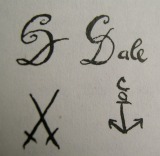 * This shape is illustrated in "The Pottery & porcelain of Swansea & Nantgarw" by E. Morton Nance, plate CX (K,L) and CLXV (E). A pair of rare early shell-shaped dessert dishes, hand-painted in chinese style on a cobalt blue ground and gilt c.1800. 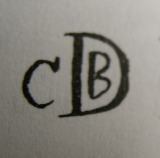 Dimensions: 20.5 cm. x 19.5 cm. Condition: minor ware on the gilding. Unmarked. A Rare John Rose Triple Stand c.1803-8, hybrid hard-paste porcelain, with ring handle, decorated with blue printed dragon pattern*. 15cm high. Unmarked. Condition: A hairline on the handle. * This pattern is illustrated in "English blue and white porcelain" by Geoffrey A. Godden page 497, plate 624. A Pair of John Rose Porcelain plates c.1800-1805, of lobed-edge form, hybrid hard-paste porcelain, richly decorated with a dragon within a star of David border and panels of stylized flowers, tigers and ho ho birds, the under sides with floral meanders. Dimensions: 20.5cm diam. Unmarked. Excellent condition. An early Coalport Porcelain plate c.1800-1805 of lobed-edge form, hybrid hard paste, hand painted in "Dragon and Phoenix" pattern. D.8"(20.5cm). Unmarked. Fine condition. A Coalport Porcelain Christening Jug, finely painted on both sides with landscapes, inscribed "Thomas Lewis born may 5th 1809" and "Remember"(on the base) in gold. 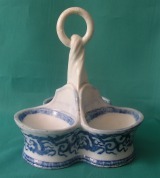 6"(15.2cm) high x 9"(23cm) from handle to spout. Unmarked. Condition: some ware on the gilding. 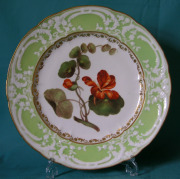 A Fine dinner plate of the early 1820s, with the standart double-barred scrolls and festoons in low relief against a green ground, and finely painted flower motive at the centre. Impressed mark "2" Diameter: 10"(25.5 cm) Excellent condition. 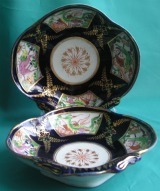 A pair of plates in "Japan" pattern c.1815-20 with gadroon-moulded edges, painted in an Imari palette. Dimensions: 9"(23cm) diam. Fine condition. Unmarked. A pair of dessert plates c.1820-25, with moulded borders incorporating double-bared scrolls and festoons in low relief against light blue ground, finely painted with flower groups at the centre. 9.5"(24cm) diam. Some ware on the gilding, one plate with a hairline crack. Marks: Impressed "2", one plate marked with the "Society of Arts" backstamp printed in brown. A dessert plate, pattern 988 c.1820-25 of "New Embossed" design with a dark cobalt blue ground colour, the embossed work revealed in white and highlighted in gilt, the flowers within the panels are painted in natural colours. Dimensions: 23 cm diam. Marks: impressed "2". Excellent condition. 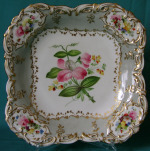 A square dish c.1815-25, featuring "embossed" style moulded decoration with painted studies of flowers, birds and butterflies. 8"(20.5cm) x 8"(20.5cm). Fine condition. Unmarked.